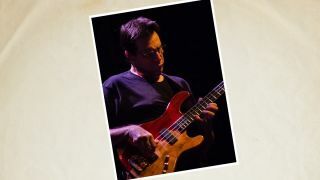 Jeff Berlin is widely regarded as one of the best bass guitarists in the world. Since hearing Jack Bruce's work with Cream at the age of 14, he's been a man possessed by a fiery muse. "It shocked me as if I was hit by a truck, says Jeff of first hearing Bruce. "I'm still quaking: Jack's bass playing, Jack's voice, Jack's musical vision was so compelling to me. It was as if he had existed in music for me alone." Already lined up to appear are Chad Smith, Allan Holdsworth, Ginger Baker and a certain "very famous guitarist"
Bruce and Berlin eventually became peers, but since the former passed away last year, Jeff has been devising a star-studded tribute album - a chance to repay the favour - and is currently running a Pledge Music campaign in the hope of fan-funding the recording. Already lined up to appear on the record - tentatively titled Jeff Berlin Plays Jack Bruce: 'Songs for a Wailer' - are Chad Smith, Allan Holdsworth, Ginger Baker and a certain "very famous guitarist" who has thus far asked not to be named. There are reportedly more to come. "I'm very fired up about it," says Jeff. "I don't stand to make any money. It's not my interest. My interest is to record this, release it and tour it. Jack was a hero to me and it begins with the millions of music appreciators out there. They're the ones we need." "If somebody wants to learn how to play, there are only two ways to do it. "One is the self-taught route, for free, which encompasses what anybody wants to do on their own for free. It encompasses all the bands they play with, all the amps they try, all the different techniques that they've seen and heard. The second way is through music only: academic, perfect, functional music. Because music tells us where to put our fingers and why. "We learned English that way: we listened when we were children and then we went to school and we learned how to read and write. So everybody that expresses themselves in English - couples expressing love for each other, someone angry at the news - are emotionally and articulately capable [of learning music]. That expression all came from an academic training base. So you can use both methods side by side and I would advise that you do." "A lot of things players think about are not as necessary to be considered as they are to be felt. What happens with a lot of players is that they're looking for results, but they're not going to get them when they think. "People are often concerned about things that they're told they need to worry about, but the real need of any musician is to realise one thing: if you've bought a guitar, a bass or a drum set, you are already committed to making music on it. "The direct and uncomplicated next step is to get a good teacher who only - repeat - ONLY teaches music and to listen to music and learn via self-taught approaches. The only thing that makes us play better is knowing where to put our fingers on the neck and why. "The better we get at it, the more your attitude is, 'Wow, I can play without thinking!' And thereis the freedom of being a player." "My third tip is don't be a player until you're ready. People are buying home studios, trying to put their music out and many can't tune a guitar without a tuner! "This is not a good thing for any of us as players. What I say is, 'Don't aim higher until it's reasonable to'. Play with bands in your area, practice your music, develop your ear… Everybody trains in every sport or every artistic endeavour, but bass players and guitarists feel that they don't have to do it and I'm not sure why they complicate their musical development this way. "The goal will come when it's ready. People advise things that I feel are not useable, so just spend a year or two and actually learn how to play the instrument first. Play gigs and grow from there, every musician needs to do that as part of the self-taught approach." "It's not something that comes on a Tuesday at 4am. It's not 'I am there!' It's an increased gradient. "You become better and automatically you'll play with better people and better opportunities will organically come into your life. It's always been like this. Allan Holdsworth is a dear friend of mine and he's very unhappy with his guitar playing! "Take our famous late friend Jaco Pastorious: he was a kid in Florida and as he grew in music and played in a few bands, the word got out and his fame got bigger and bigger until regionally he was very well known and then an international opportunity came along. "How do you know when you're there? You don't quite. Allan Holdsworth is a dear friend of mine and he's very unhappy with his guitar playing and is constantly complaining about it! I'm not happy with everything I do. I'm 62 years old and I'm still studying! You don't know 'when'. It's an ongoing search." "[Traditionally] anybody that became a good musician was fired up enough to never let anything stop them. "Today people are kind of hand-held and saying, 'What should I study? What should I think?' All you're supposed to know is where to put your fingers on the neck, a few basic hints in order to become a good player - and that's it! "If you want to play, as every great player did, you don't need to be coddled, you don't need lessons from the internet, which for the most part aren't useful anyway, I'm sorry to say. You need to get into the instrument and music, if you want it. I'm not convinced that everybody does want it. If you do, you'll burn down a building, you'll knock down a wall! "What makes you a better musician is your own internal fire. Look at every great player in history to verify this point of view."